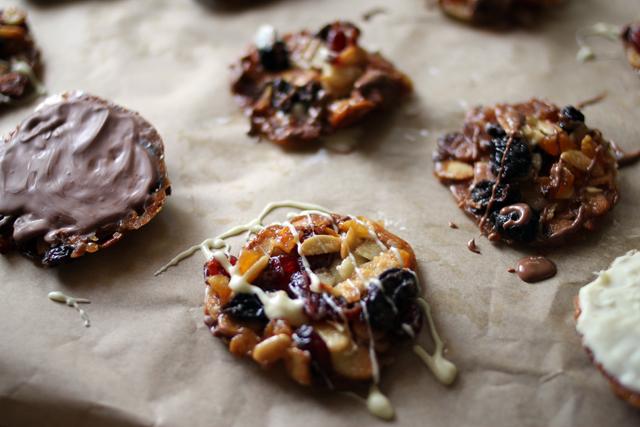 Florentines are most definitely one of my favourite sweet treats to enjoy during in the festive season and whilst I have had my fair share of the shop-bought variety, I had never attempted to bake my own. I appreciate that most of the time when I post about a recipe I say how easy they are (I really like easy recipes), however this is genuinely really simple and so quick to do, I managed to prep and bake a batch in around half an hour! This recipe is adapted from the book 'Seriously Good! Gluten-Free Baking', which if you're after a great gluten-free baking book with lots of basic recipes as well as fancier ones, you should certainly look into getting this! 1. Preheat the oven to 180ºC and line two baking sheets with baking paper. 2. Place the butter, sugar and honey in a medium, heavy-bottomed pan over a low heat. Do not stir, but use the pan to swirl the ingredients together occasionally. 3. Once the butter has melted, add the rice flour and stir continuously for about 3 minutes until it becomes thick and golden in colour. 4. Remove pan from the heat and then fold in the almonds and dried fruit until evenly mixed. 5. Scoop out teaspoon size mounds and place on the baking sheets, allowing room for spreading and flatten each mound slightly. 6. Bake in the oven for about 8-10 minutes, until golden and caramel-coloured. 7. If they come out of the oven slightly misshapen, you can carefully shape them back into rounds using a knife, but they will be very hot so be extra careful. 8. Leave to cool slightly on the baking sheet and then using a spatula, transfer them to a cooling rack to cool fully and harden. 9. Place the chocolate in two separate small bowls and microwave for about 40 seconds, stirring halfway, or in a heatproof bowl over a pan of simmering water. 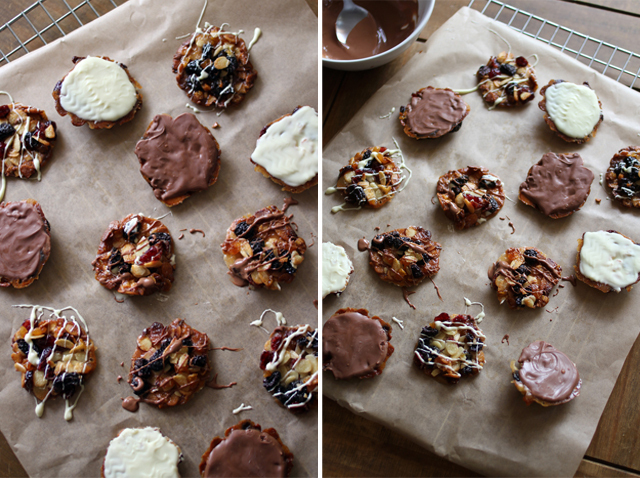 When melted spread each type of chocolate over the back of half of the florentines, leaving a small amount to drizzle over the top and place in the fridge to set. 10. 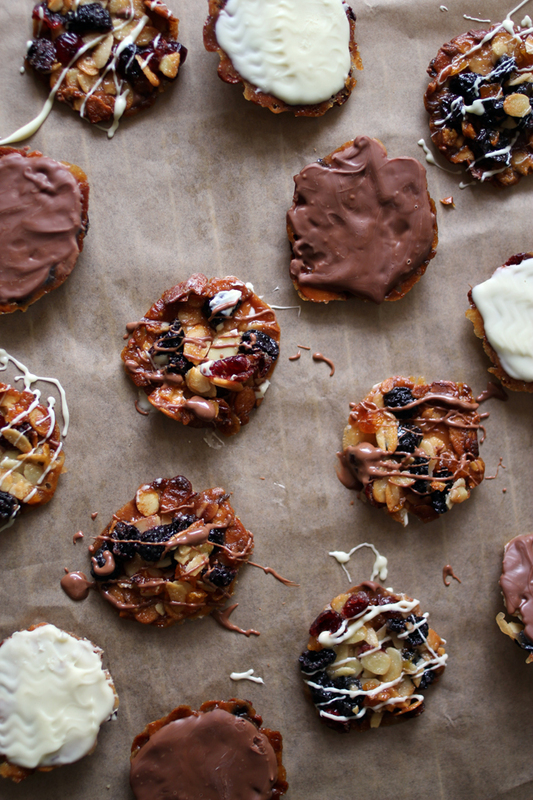 Use the remainder of the chocolate to drizzle over the top of the florentines. I used milk chocolate over the top of the white ones and white over the milk. Leave to set and then enjoy! They are sweet, chewy, crispy and fruity, a totally scrumptious quick treat. I'm also seriously considering making some more batches of florentines and wrapping them up to give to family as gifts. For those of you who followed my Quitting Sugar journey, you may be surprised to see a sweet treat on my blog, however I have since reintroduced sugar into my diet, albeit in pretty small amounts and maybe once or twice a week if that. The main purpose of the sugar detox was to be able to allow myself to eat a small amount of sugar without the need to scarf the lot in one sitting. I'd love to know what festive treats are your favourites as I'm always looking to try and bake new things. As always, if you do try this yourself do let me know in the comments or a tweet.